The Florence Bird Lecture, one of the major lecture series at Carleton University, is named in honour of Senator Florence Bird who served as the Chair of the Royal Commission on the Status of Women (1967-1970). Each year, the Lecture features a prominent individual and highlights their important work in their respective field. The topics of the Florence Bird Lecture have varied significantly over the years, but always focus on areas of particular concern for an equitable and just society. 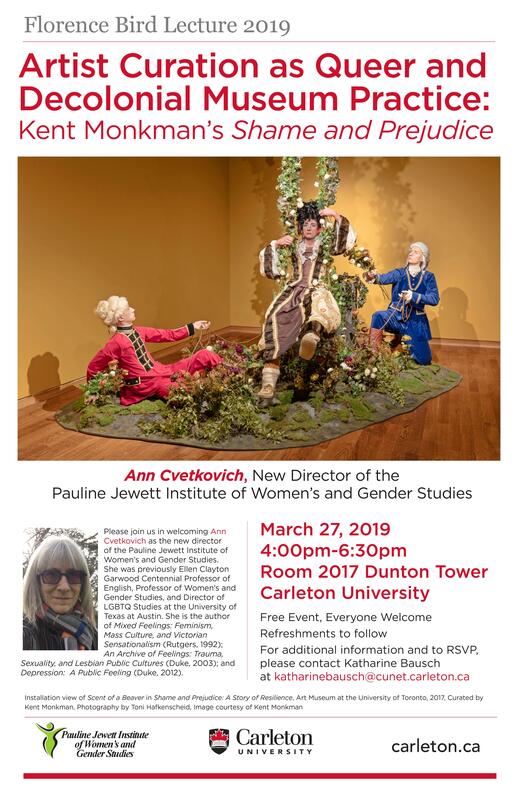 Our 2019 Speaker is Ann Cvetkovich, the new Director of the Pauline Jewett Institute of Women’s and Gender Studies. Join us for this special talk. Everyone Welcome.